In the beginning, virtual reality was all about the visual: being able to look around and see all of the virtual world you were immersed in. Then we wanted to be able to control our movements in that imaginary space, so inventors created motion machines that let us walk in real life to move around in VR. Now, the sense of touch is joining the party. The UnlimitedHand from Japanese group H2L is a simple device that wraps around the forearm. It contains a haptic sensor and a bunch of electronic muscle stimulators. The tiny EMS cluster sends out little electric shocks into your arm, simulating certain sensations like encountering resistance when you touch virtual objects. A small vibration motor makes the feeling more robust and realistic. The haptic sensor tracks your arm’s movement, letting you move that limb freely and in real time in your virtual world. 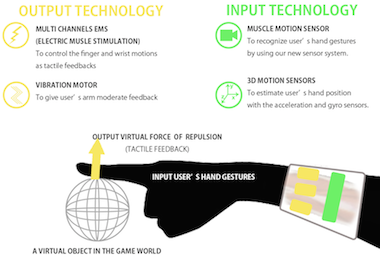 Even your hand movements are tracked so you can grasp and interact with objects while feeling them as though they were actually in front of you. According to the creators, the small electrical pulses from UnlimitedHand pose no danger to users’ health. They plan to offer the device on an open platform to allow developers to integrate their own applications. Of course, this kind of high-tech toy doesn’t come cheap: the price starts at $188. But once you invest in an immersive VR system like Oculus Rift, chances are you’ll want the most realistic experience possible. UnlimitedHand seems to be the perfect way to give you that awesome experience. See more in Gaming & Geek or under Gadgets. October, 2015.